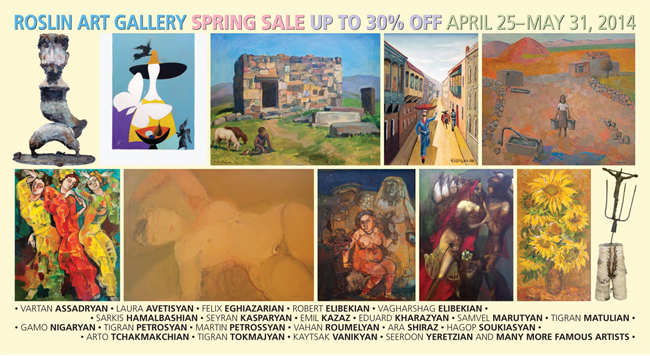 ROSLIN ART GALLERY - Armenian art, Greeting cards, Art Books, and Posters. The name of our establishment, Roslin Art Gallery, is a homage to the greatest medieval Armenian illuminator Toros Roslin. Roslin Art Gallery is a thriving center for art, a dynamic meeting point of centuries old Armenian art and contemporary fine art. A crossroad of art from the diaspora and Armenia, the gallery aspires to promote and introduce Armenian art, and to satisfy the palettes of art lovers and collectors. WE ARE EXCITED TO ANNOUNCE OUR SPRING SALE! Copyright © 1998 "Roslin Art Gallery"